NOTE: The photos and information contained on this page are copyrighted. No material may be reproducted without written permission from the site owners. Just as Nelson and Chase were pulling off the road in order to face Hollis and Cowley, off-duty Illinois Patrolman William Gallagher, on the force for less than two years, was at Bob Malone's Sinclair service station and cafe about 250 feet from where Nelson stopped. 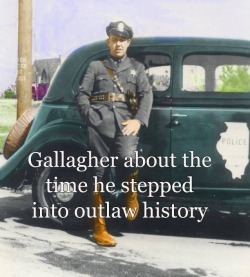 Malone's was a favorite gathering place for patrolmen, and Gallagher was a regular there. A big Irish cop, he always had a funny story to tell and was known for the practical jokes he played on friends. The product of a large family, Gallagher was still living with his parents, but had recently met the woman he would eventually marry. It was Tuesday, and Gallagher and Malone were discussing their Thanksgiving Day plans when they hear the first shot. At first they both assumed it was a car backfiring, but a second later there was another crack, then a quick burst, and then it seemed to the pair that a thousand guns going off at once. Gallagher knew that much gunfire meant trouble, and he reacted immediately. With no service revolver, he grabbed Malone's loaded .22 rifle, routinely kept at the station, and ran out the backdoor. In the distance he saw two vehicles. He could see four men, two at each car, firing guns at the opposite vehicle. Smoke was rising from the high-powered weapons being used by one of the pair. The two men near the car closest to him seemed to be pinned down and out-gunned. Gallagher began to half sprint, half crawl along a drainage ditch toward the four men. As he neared the first car the shooting had stopped, and he saw someone lying in the ditch. The scent of blood was strong. At first Gallagher thought the man was wearing some sort of odd hat or scarf, but as he crawled closer he realized it was the back of the man's head ... or what was left of it. Brain, bone and scalp mixed with the damp, brown earth of early winter. There was nothing Gallagher could do for him. He was dead. Gallagher saw another man further along the ditch and began making his way toward him. Unable to see what was happening on the road, Gallagher could hear voices and the sound of a car engine. The sound of gears shifting and the whine of a car being driven in reverse. Leather-sole shoes hurrying along the pavement. Bits of conversation. "... come on, get them ..." "Jesus it hurts ..." "... her coat ..." Suddenly a woman's voice. "... Jimmie?... Jimmie? ..."
Gallagher reached the second man. The coppery smell of blood and damp earth was almost overpowering. The man lay on his right side and was holding his stomach. Blood was visible and it dripped thickly from between the man's fingers and from several wounds. Gallagher noticed the soft rain that had been falling off and on during the day had damped the man's hair. Not knowing what to do, but feeling he had to do something, he brushed it aside and the man's eyes opened. Gallagher asked who he was, trying to keep his voice low. The sound of movement was just over his left shoulder. He asked again and the man seemed to focus. He identified himself as a federal agent. He said he had been chasing Baby Face Nelson and that Nelson had shot him. "Oh, Christ," thought Gallagher. "That's Nelson up there." The agent tried to say something else but Gallagher couldn't hear him over the sound of the movement just a few feet from him. He heard the sound of metal on metal; doors opening and closing; more voices; and then the grind of a car shifting gears and start to pull away. It was now or never. Gallagher was off-duty. He had the rifle but no additional ammunition and no way to get help. Was it really Nelson? He was scared, but he was a cop and he knew what he had to do. Just as the vehicle was starting to pull away Gallagher stood up. In a split second he saw the car ... the roadway ... someone behind the wheel ... another person in the passenger seat. Or was it the backseat? .... The smell of gunpowder was still strong on the wind. Gallagher heard the dying agent shift in the cold, damp leaves near him. Gallagher shouldered the rifle and opened fire as the car pulled away. Gallagher would say later that he thought he saw the driver jerk and half turn toward him, but the vehicle continued to gain speed. Gallagher wasn't sure if he had hit the driver. He had to get back to Malone's and get help. He was trying to focus on the vehicle's license plate number when the unthinkable happened. The car stopped. Gallagher was certain Nelson, or whoever was in the car, was coming back for him. There was no place to hide, he had only a bullet or two left in the rifle and he was scared. Was he going to die alongside the two young agents? He had just celebrated his 26th birthday a few days earlier. It wasn't fair that it was going to end like this ... in a wind-swept drainage ditch on a cold, damp November day. The passenger door opened and someone jumped out and ran around the front of the vehicle. As Gallagher gripped the rifle and prepared himself for the fight - and likely a painful death - the man opened the driver's side door and appeared to be pushing something out of the way. He then jumped in and the car sped off. The vehicle's occupants simply paid no attention to Gallagher. The battle of Barrington was over. Gallagher told the dying agent he would bring help. There was nothing he could say to the second agent. 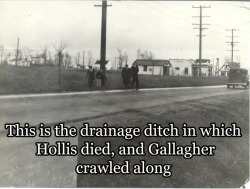 Gallagher ran back to Malone's along the same ditch he had so carefully crawled along just minutes before to get help. So, just what role Gallagher actually played in this event has been debated for years. Some say the story you just read is true. Others say Gallagher's only role was that he happened to be one of the first on the scene, and may have even fired a round or two from the .22 in the general direction of the fleeing car, but had no real part in the event. No matter what, he was there. That's a proven fact. But his role, whatever it was, would be written out of outlaw history by the FBI in the following days.